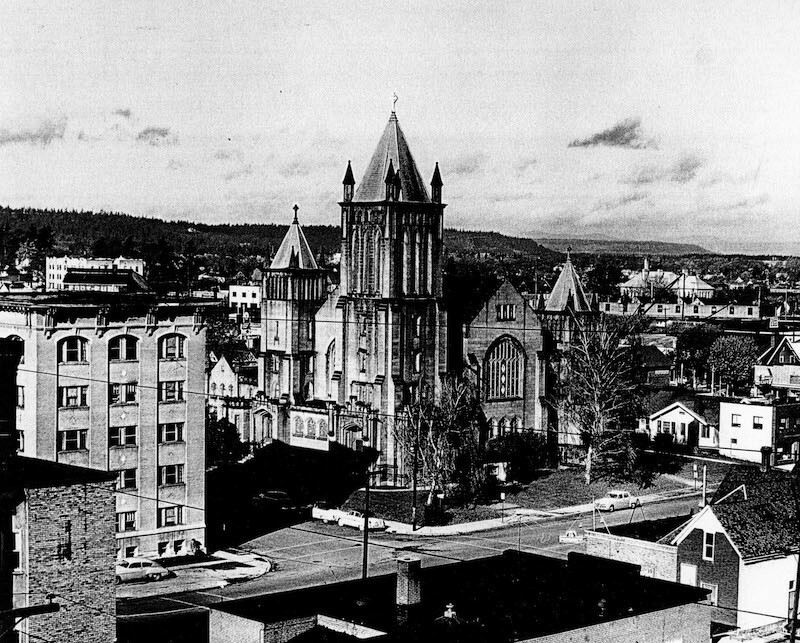 Founded in 1883 when Washington was still a territory, the First Presbyterian Church has grown up with the City of Spokane. Reverend Thomas G. Watson came to Spokane from Wisconsin in 1883 by request of local inhabitants to lead a Presbyterian congregation. The church initially had no permanent home, so Watson would hold services in various locations around town including the Cannon Building, Glover's Hall, and the Van Dorn Opera house. By 1886 the band of wandering Presbyterians was able to raise funds to build a home. The first church was located on the corner of Monroe and Riverside, where the Spokesman Review building currently stands. After just three short years the church was offered a sum of money too high to pass up, and sold their lot to the newspaper. In 1889, the Great Spokane Fire destroyed all of their possessions when their temporary home, the Falls City Opera house, burned. Joining in on the post-fire building boom, the First Presbyterian Church opened their doors a second time on the corner of Second and Jefferson in 1890. In 1892 the Church hosted the funeral of Spokane Chief Garry, the first Native American on the Columbia Plateau to attend school at the Hudson Bay Company settlement at Red River. Whites and Natives alike joined together to honor this leader who had been a (sometimes) devout Presbyterian. 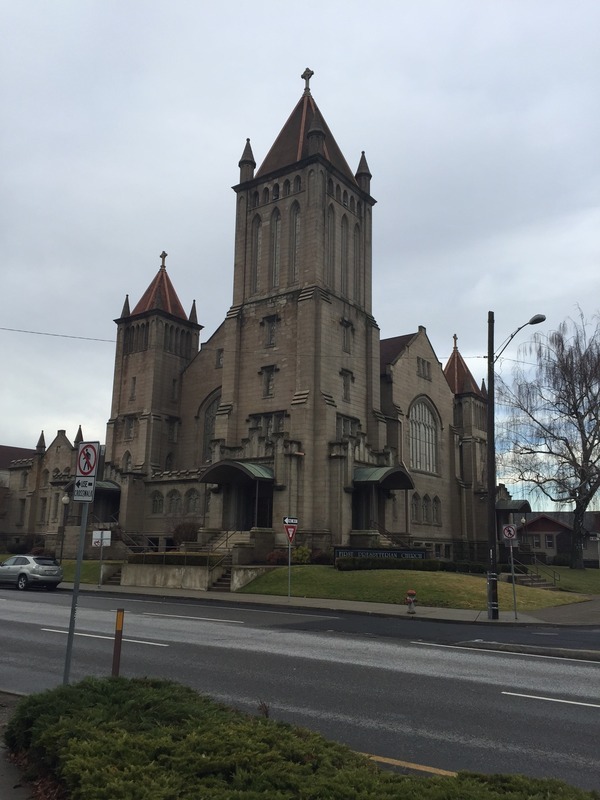 The church made one final move in 1910 to the current location of Fourth and Cedar. Designed by architect Loren Leighton Rand, the grand building in the Gothic Revival style is still a sight to see. 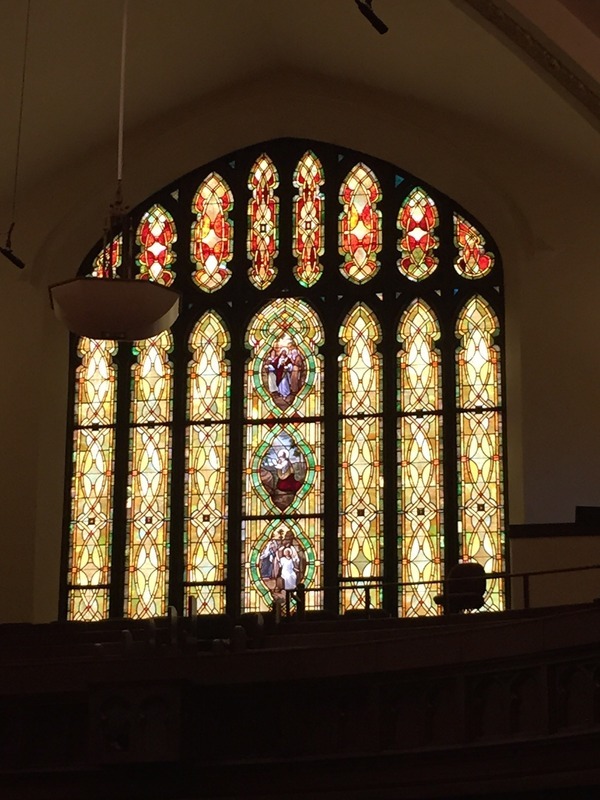 With beautiful stained glass windows based on the Sainte Chapelle in Paris, and one of the largest pipe organs in town, the builders spared no expense. By 1952 the growing church needed additional space and built additions to the main church including a gym, classroom space for children, and a commercial kitchen. 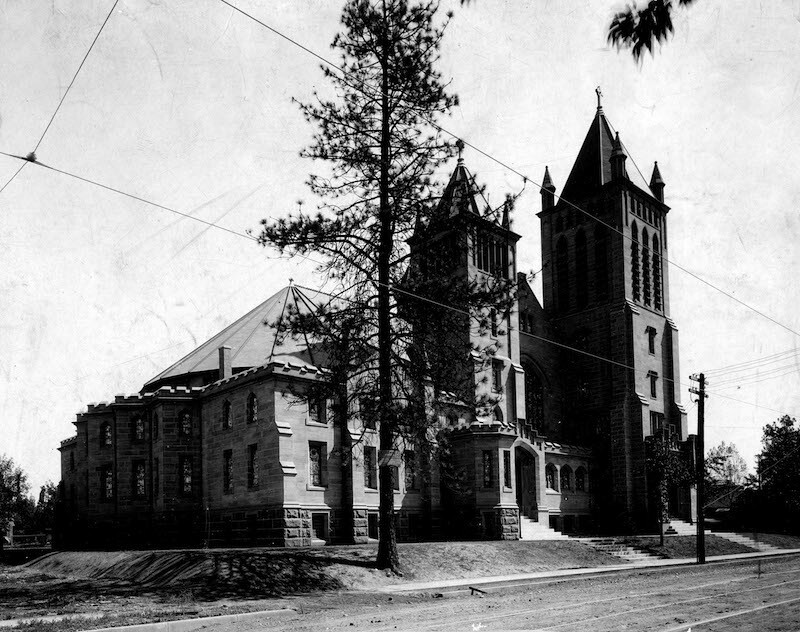 The First Presbyterian Church has stood the test of time in Spokane. The Church is very proud of its history and most recently celebrated their 130th anniversary. 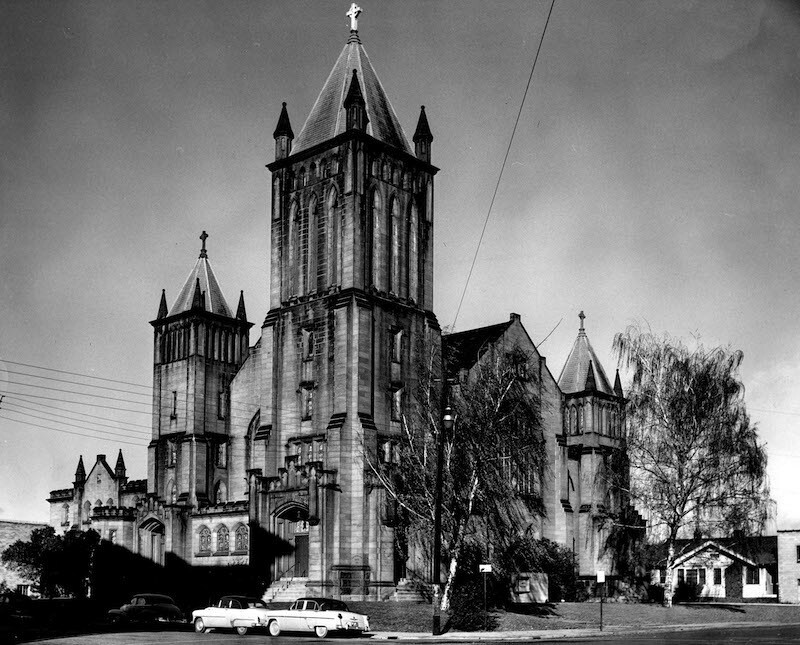 Exterior of the Church, 1950s: This photograph shows the southeast angle of the church. Image courtesy of the Whitworth University Archives. 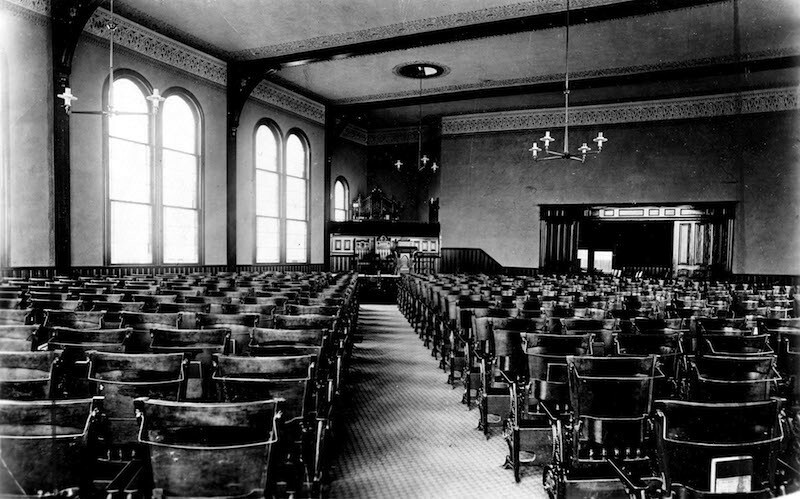 Interior of Church on Second and Jefferson: The interior of the second home of the First Presbyterian Church at Second and Jefferson is displayed in this photograph. The interior size of the church is impressive, with significant amounts of seating for large Sunday services. Image courtesy of the Whitworth University Archives. 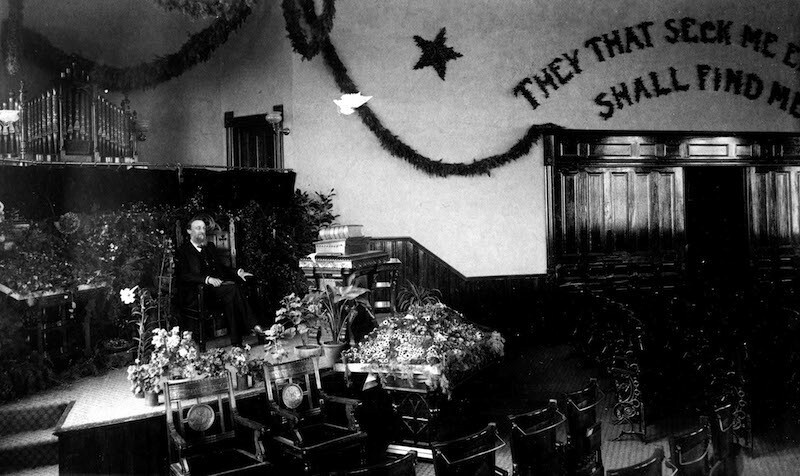 Reverend Thomas G. Watson, 1891: Watson is photographed in the First Presbyterian Church on Children's Day. Arriving in Spokane in 1883 from Wisconsin, Watson was the first reverend of the church. Image courtesy of the Whitworth University Archives. Exterior Southwest View: This photograph shows the southwest angle of the church. The exterior wall on the left side of this image is now covered by the large 1952 addition. Image courtesy of the Whitworth University Archives. 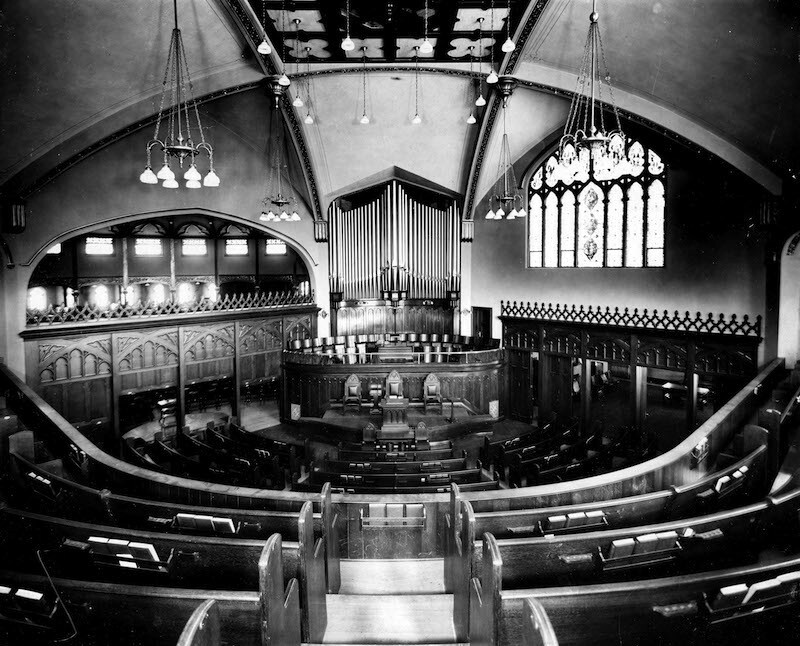 Interior before 1952: The interior of the First Presbyterian Church on Fourth and Cedar. Image courtesy of the Whitworth University Archives. First Presbyterian Church Before I-90: This photograph gives a view of the church before many of the surrounding buildings were demolished for the interstate. Image courtesy of the Whitworth University Archives. Southeast View of Church, 2014: This modern photograph of the building shows the exterior of the First Presbyterian Church at Fourth and Cedar has retained virtually all of its original character and detail. Image courtesy of Allie Honican. Stained Glass Window, 2014: This photograph is an interior view of one of the three large stained glass windows in the current church. The Willet Stained Glass Studios of Philadelphia, PA came to Spokane in the summer of 1993 to repair the stained glass in the building. Image courtesy of Allie Honican. 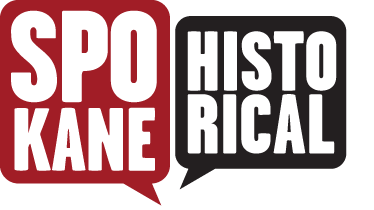 Allie Honican, “The First Presbyterian Church,” Spokane Historical, accessed April 20, 2019, https://spokanehistorical.org/items/show/493. Gray, Alfred O. Spokesman Review. "First Church Became 'Mother of Presbyterianism' in Spokane Area," June 1, 1958. Lewis, William S. The Case of Spokane Garry (Washington State Historical Society, 1917). Spokesman Review. "Entered Village in 1883: Early History was Full of Moves as Growing Town Forced it to Seek New Quarters-Finally Built Present Edifice in 1910," June 3, 1933. Spokesman Review. "Recall Days of Church Founding: Pioneers' Fight With Old-Time Evil Influences Told at First Presbyterian," June 12, 1923.